The PivotLab at Purdue University performs research in information visualization, human-computer interaction (HCI), and visual analytics. Explore this website to find out more about our research activities. Pivot is always looking for talented new members. If you are a PhD student interested in information visualization or human-computer interaction, please read more about our available positions. Prof. Niklas Elmqvist has just been awarded an NSF CAREER award for a project on ubiquitous analytics! Watch this space for more information. Award abstract here. 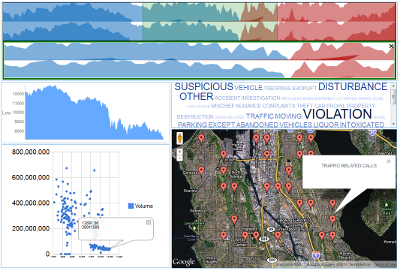 IEEE VisWeek 2012 is currently ongoing in Seattle, WA and Pivot has four presentations this week: typographic maps (InfoVis), temporal correlation (VAST), the role of time in investigative analysis (TVCG), and visualization in games (TVCG). Come see our talks! Check out the Purdue news release on our work on extended multitouch that is being presented this month at the ACM UIST 2012 conference in Cambridge, MA! Pivot will be presenting a paper called "Branch-Explore-Merge" at the ACM ITS 2012 conference in November in Boston, MA. In other news, please check out our SpeechDelta and ThemeDelta project websites for ongoing work! © 2012 by Pivot Laboratory at Purdue University.